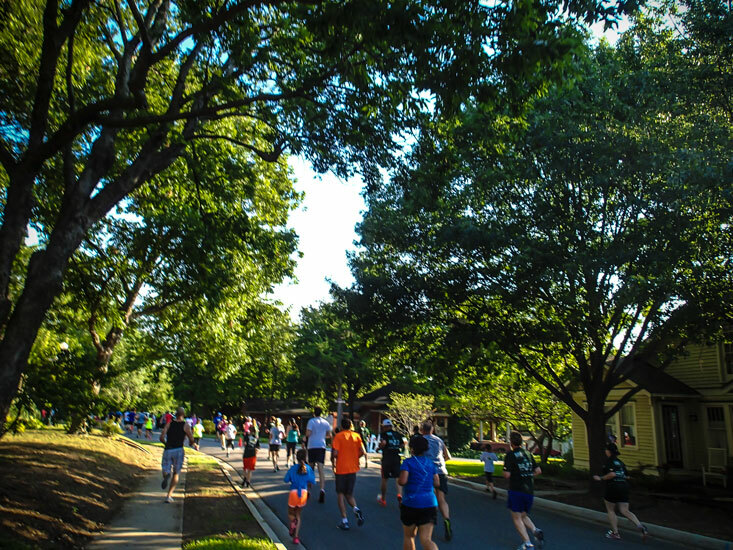 5k runs like this one are fun, easy, and a great way to get some exercise in on a Saturday morning. 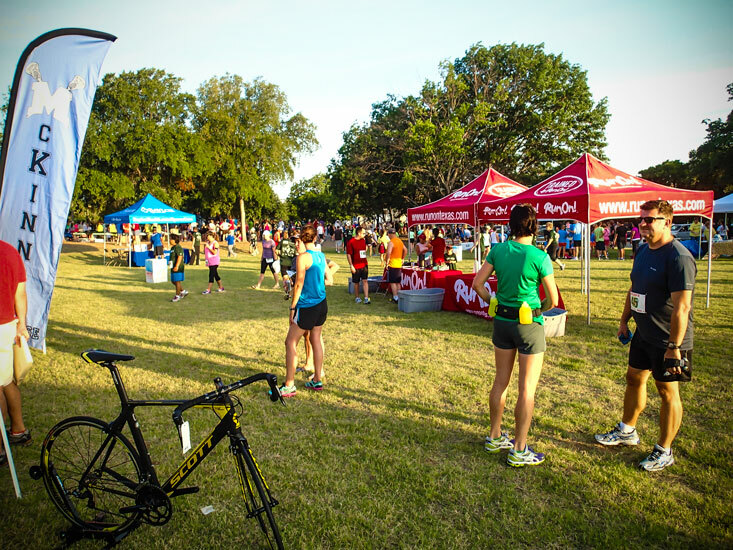 Sometimes you sign up for a race because it’s just awesome. Sometimes you sign up because it scares you a bit. 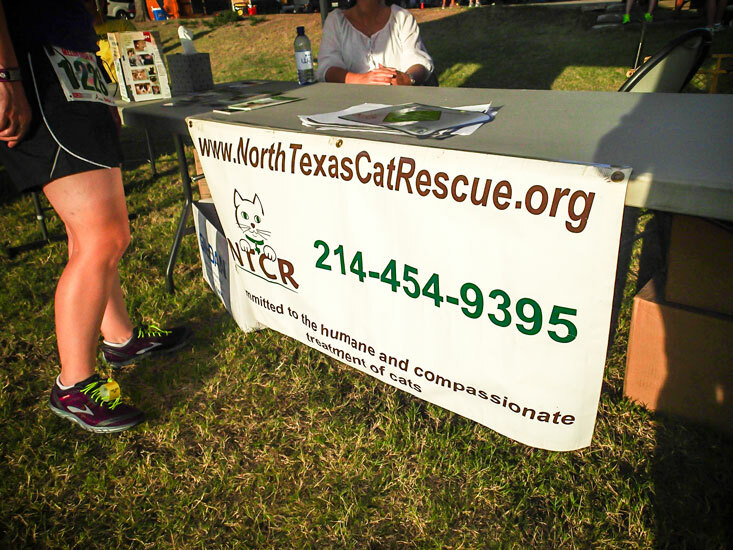 And sometimes you sign up because the race supports a cat rescue — and because the cat rescue’s logo is a cat, and that cat is printed prominently on the tech shirt you get in your race packet. 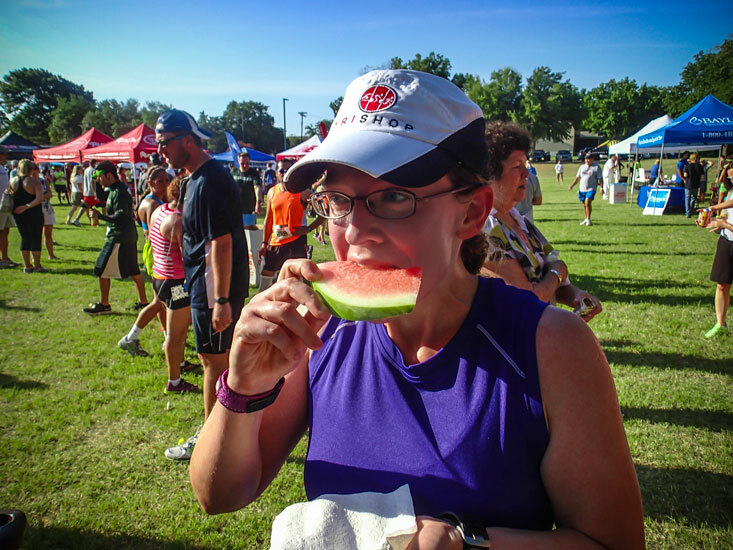 The Melon Dash 5k falls into the latter category, and it was awesome. 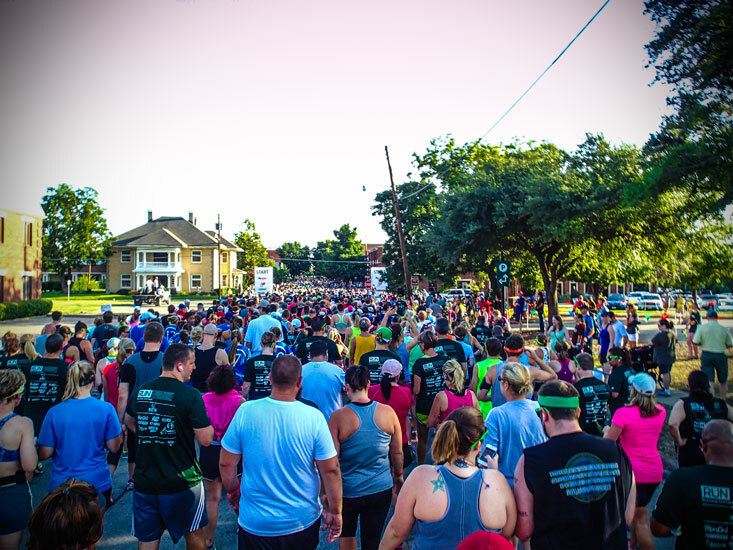 Not only did it support the North Texas Cat Rescue, the Melon Dash also started and finished in downtown McKinney, Texas, a suburb that’s not far from our house. This was great, primarily because having waited until 9 o’clock last night to eke in my fifth on-schedule swim workout just under the end-of-the-day wire — followed by a long, relaxed dinner — we didn’t get to bed until well after midnight. Oops. 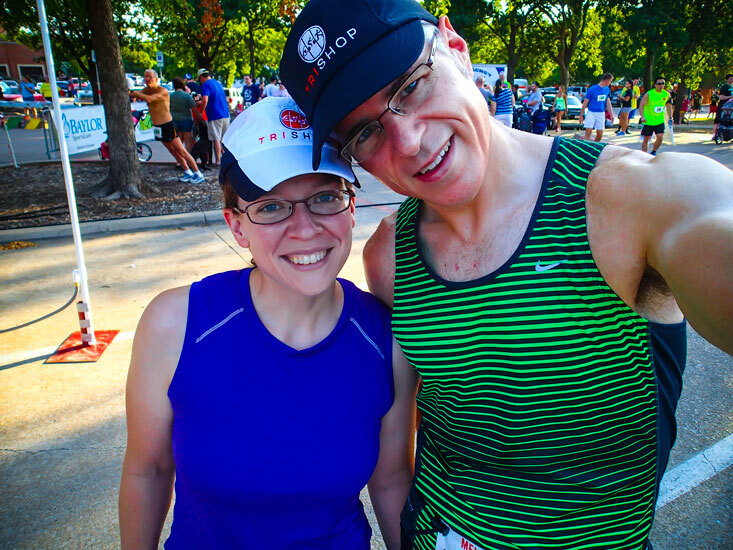 Still, because the race was only a 20-30 minute drive away, we figured we could wake up at 6 a.m., grab something simple for a snack, and easily be at the starting line 15 or 20 minutes before the 7:45 a.m. start. And, since we didn’t oversleep our alarm this time, that’s exactly what happened. 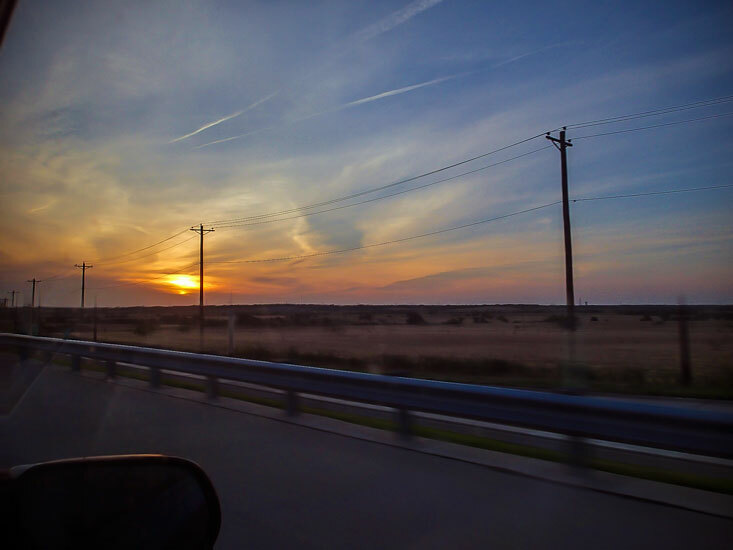 One side benefit of early-a.m. drives to events: beautiful sunrises. Audra is remarkably happy for having been in bed 30 minutes earlier. Without coffee, no less. When we arrived, we found parking about 500 yards from the start, and the vendors were just setting out their wares under tents. Where’s the coffee? Coffee? Is there coffee here somewhere? We visited the cat rescue table, of course. Kittehs! 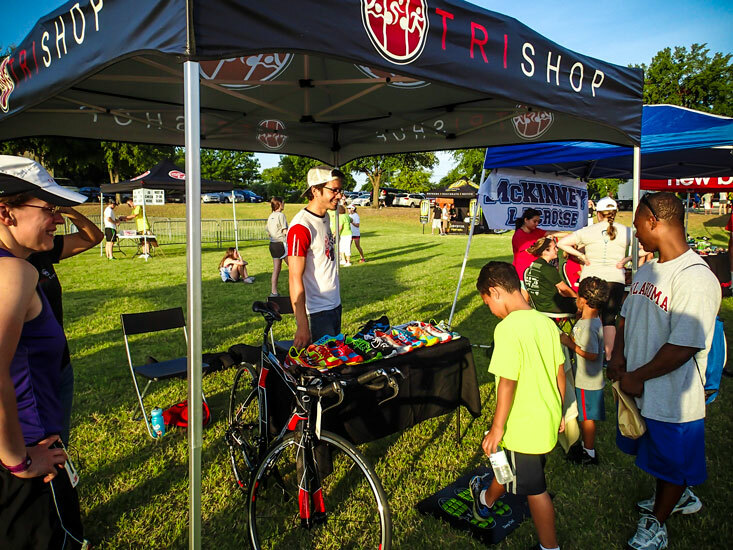 Our Tri Shop friends were there, as they are at pretty much every event in North Texas. 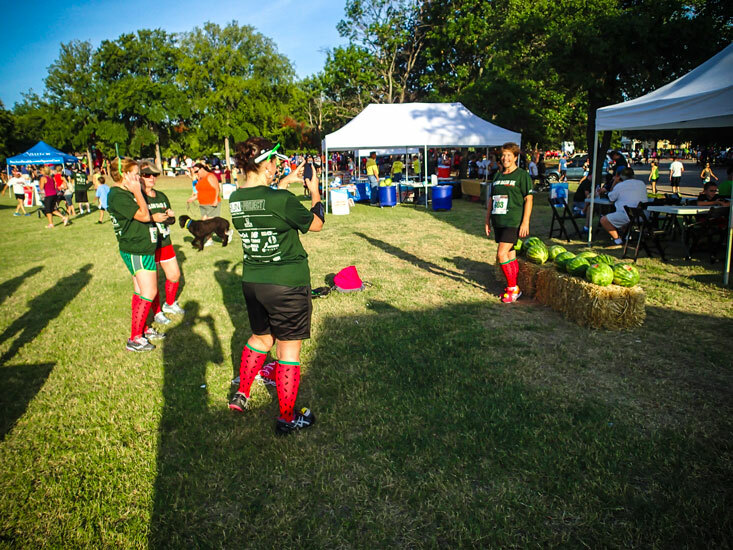 Some runners really got into the melon-themed spirit. 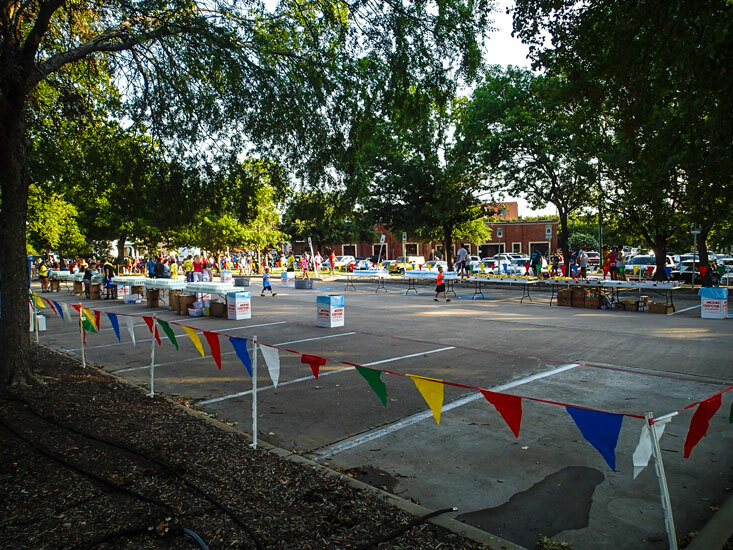 Around 7:30, the start/finish announcer called the kids and families to the start for the event’s one-mile fun run. “The 5k will start at 8:15,” he added. We both immediately thought, “we could’ve slept in another half hour,” but Audra’s face expressed it better than words. You’ll have to trust me. I was too busy lamenting lost sleep to remember to snap a picture. Thirty minutes later (and probably 10 degrees hotter, as the now-over-the-horizon sun started to pound down on us Texas-style) we made our way to the starting line, passing the well-stocked post-finish corral on the way. 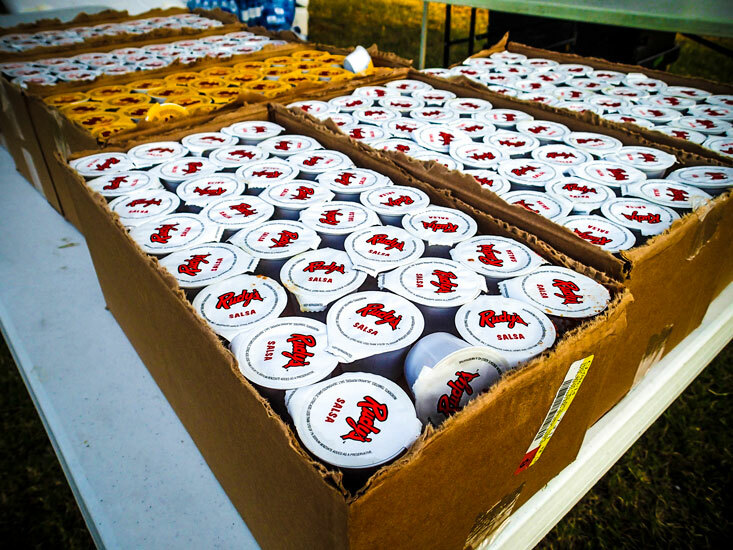 Sports drinks, ‘nanas, and bars, oh my! The start/finish line was on a residential street with lots of tree-covered areas where we could mill around, or, optionally, pretend to warm up and stretch like an Olympian. Is it time yet? No. Is it time yet? No. Is it time yet? No. 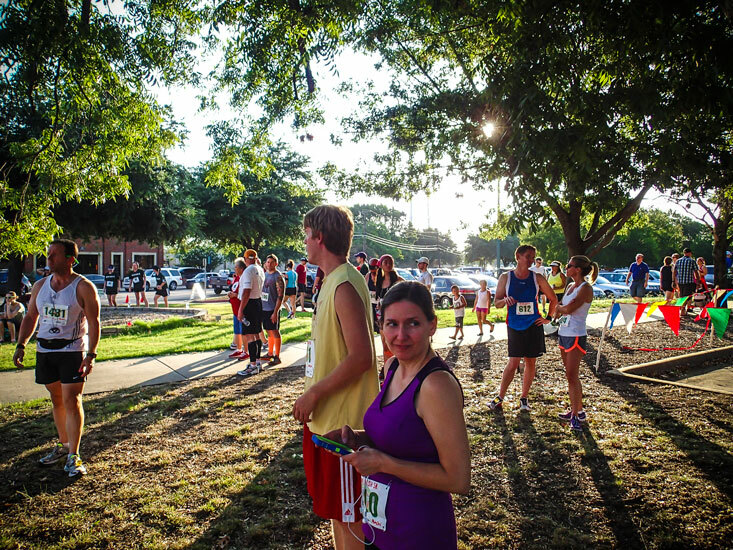 Kidding aside, the event ran right on time, and the 5k started at pretty much exactly 8:15. 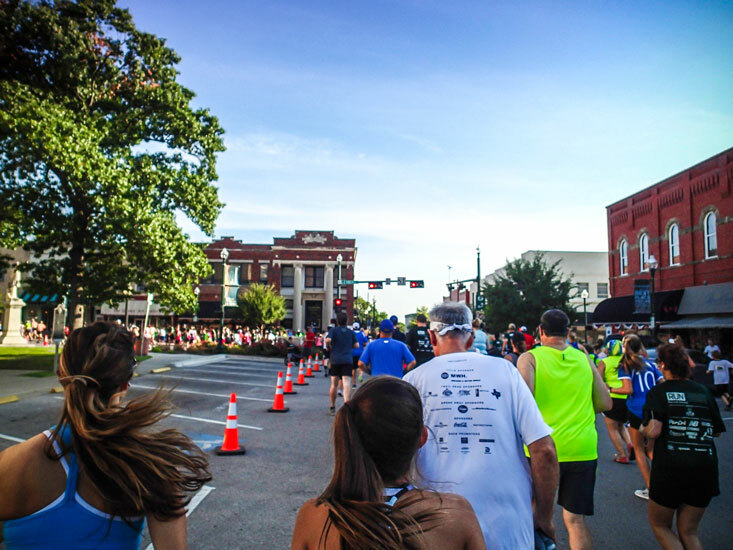 McKinney isn’t exactly a huge metropolis, but there were a lot of people at the Dash. The start actually felt like a bigger event, as it took a good minute or two to get to the starting line from the middle-back where we (lazily) queued up. Shuffling toward the start line. I checked as of early this morning, and my tri coach hadn’t added any description or intervals to the event in TrainingPeaks — usually, events like this that serve as training runs will include specific intervals for me to follow — so I approached it as a casual race. More specifically, I tried to pace myself similarly to a run test, but instead of leaving 99% of myself on the course, I shot for more like 80%. You know, not feeling like I’d puke afterward, but hurting a bit. 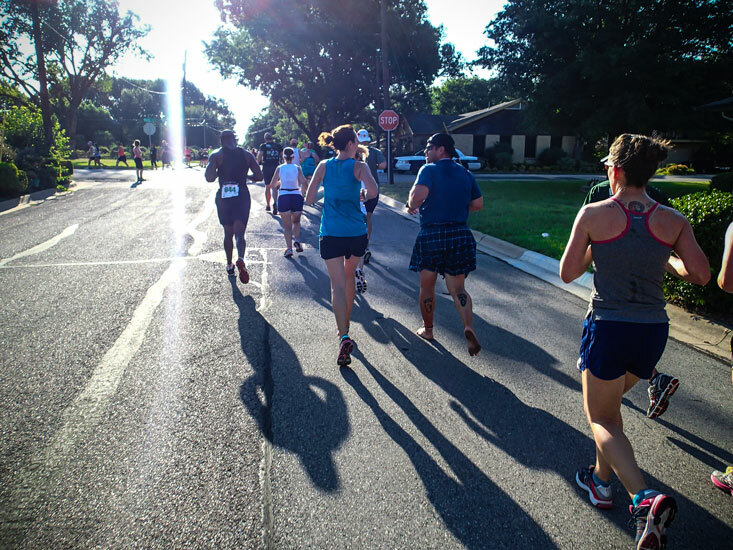 It turned out to be easy to keep the pace slow at the start, because the road was seriously crowded through the first mile. Entering McKinney’s town square. Still crowded. But friendly! One turn later, we ran through a nice older neighborhood under this beautiful tree cover. My first mile clocked in at 8:50 — not bad considering how much time I spent light-jogging in traffic. The course was an out-and-back with an around-the-block loop at the mid-point (instead of a turnaround), so I ran into the race leaders (already on their way back) not long after my first mile. Picking up speed at the mid-point loop. 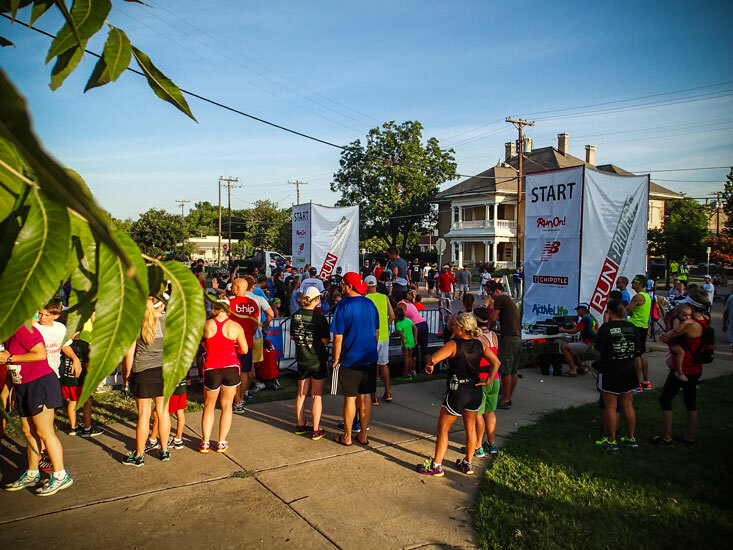 By the time I reached the loop, things had thinned out quite a bit and most of the people around me stayed around me until the finish. My 910 chirped with the second mile at 8:13. 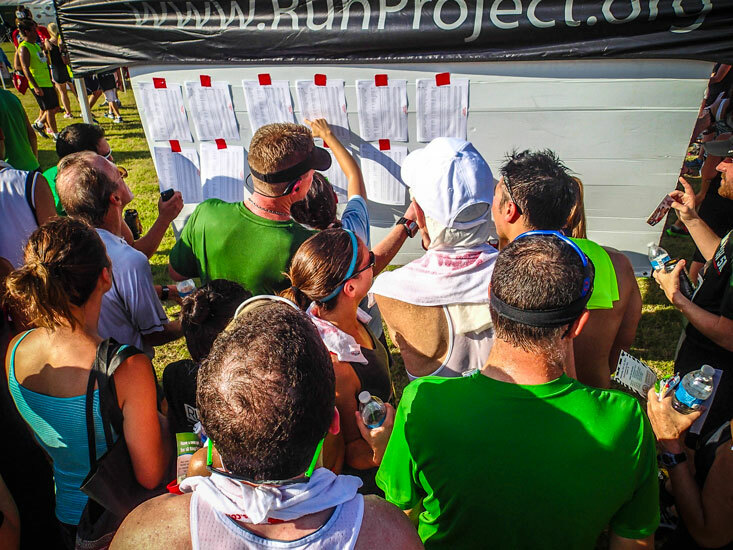 Yet another awesome feature of this course was the fact that it dropped downhill most of the last half mile into the finish, leading to lots of sweet, full-tilt-boogie finishing sprints. My third mile came up at 7:54, and by then I was accelerating down the hill like everyone else. 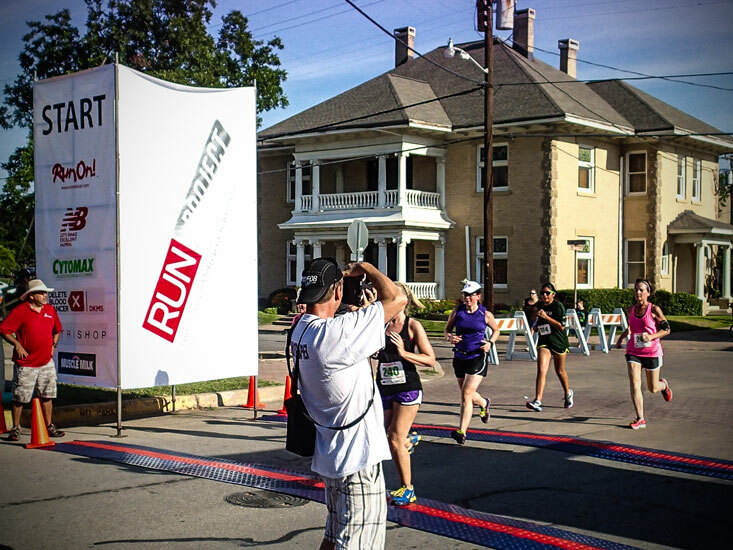 I averaged 6:36/mile over the remaining .13 miles and crossed the finish at an all-out run. 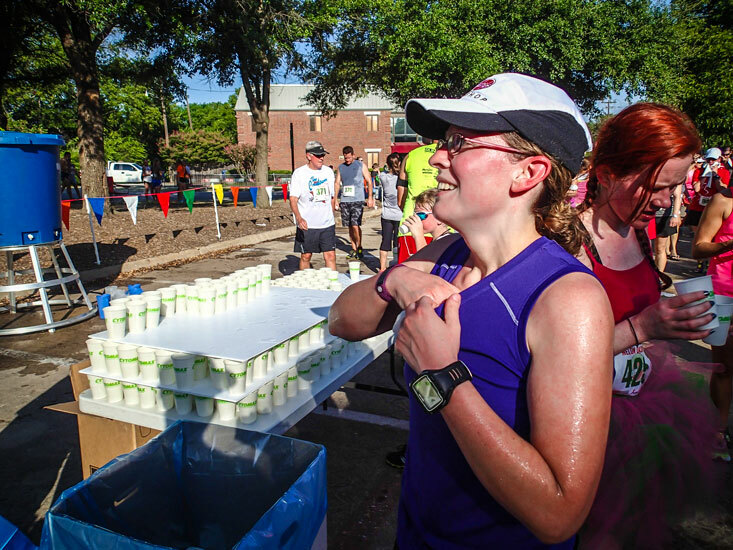 After grabbing two bottles of water from the post-finish tables, I headed back over to the start/finish to look for Audra, who finished not long after. It was hot. Damn hot. 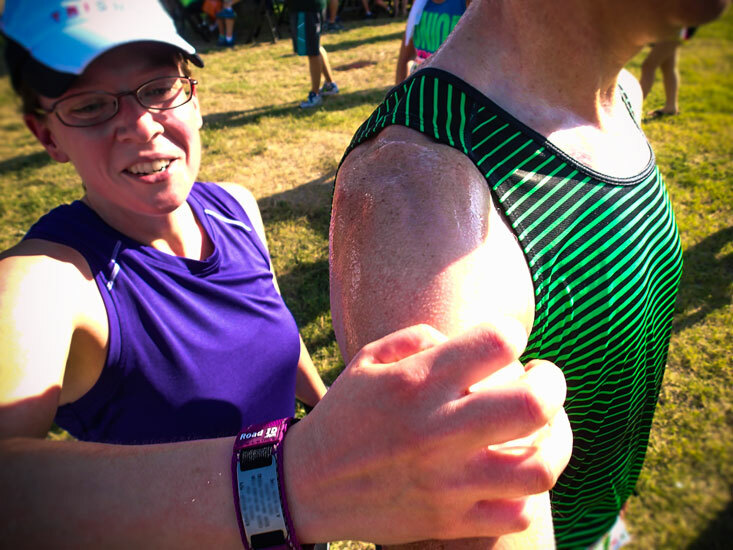 We were drenched, and the cool, wet towels at the finish felt wonderful. Audra grabbed some ice from a cooler and helped us cool down further. 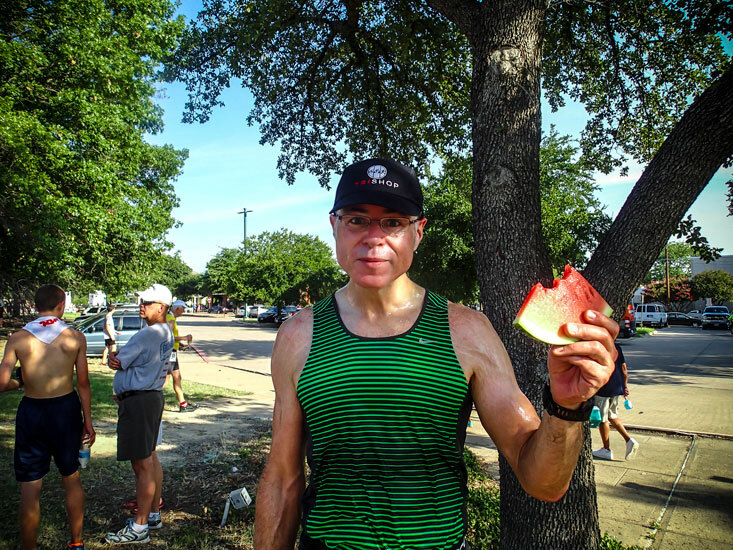 Texas post-race condiment of choice: salsa. Of course, it isn’t called the Melon Dash for nothing. While Audra caught up with some friends, I checked my results. Total time: 25:14, which placed me 14th in my age group. I’ve concluded the best way to place higher in my age group is to get older. Overall, this was a great event — lots of fun, well organized, and not too expensive. We’ll definitely be back. Finishers! Now home to breakfast, some Stargate, and a nap.